WASHINGTON — America will not cede leadership of the fight against the Islamic State group, Secretary of State Mike Pompeo said Wednesday, as he tried to allay fears that President Donald Trump’s decision to withdraw forces from Syria could imperil gains against the militants there and in neighboring Iraq. Trump’s announcement in December shocked U.S. allies and led to the resignations of Defense Secretary Jim Mattis and the top U.S. envoy to the anti-ISIS coalition, Brett McGurk. While the withdrawal would fulfill a Trump goal, U.S. military leaders have pushed back for months, arguing ISIS remains a threat and could regroup. U.S. policy had been to keep troops in place until the extremists are completely eradicated. Fears that ISIS fighters are making a strategic maneuver to lay low ahead of the U.S. pullout has fueled criticism that Trump telegraphed his military plans — the same thing he accused President Barack Obama of doing in Afghanistan. Pompeo told foreign ministers and senior officials from the 79-member, U.S.-led coalition that the planned withdrawal “is not a change in the mission” but a change in tactics against a group that should still be considered a menace. ISIS has lost more than 99 percent of the territory it once held in the two countries. "America will continue to lead in giving those who would destroy us no quarter," Pompeo said. Hecker said others would have to carry the burden once the U.S. left. 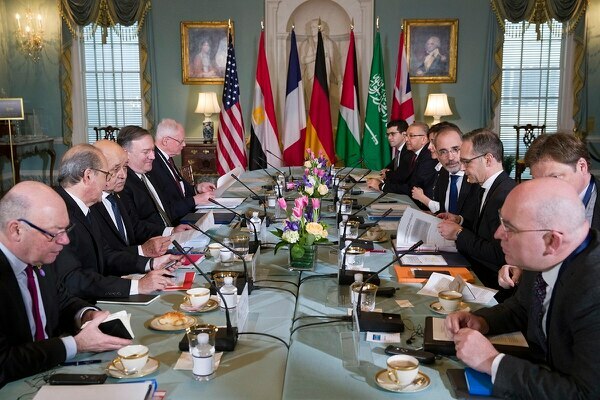 Pompeo called on the coalition to increase intelligence-sharing, repatriate and prosecute captured foreign fighters and accelerate stabilization efforts so ISIS remnants cannot reconstitute in Iraq, Syria or elsewhere. He said the fight is entering a new stage where those allied against ISIS must confront a “decentralized jihad” with more than military force. Pompeo mentioned the suicide bombing claimed by ISIS that killed four Americans — two service members, a Pentagon civilian and a U.S. contractor — in the northern Syrian town of Manbij last month. Manbij was liberated from ISIS control in 2016. The conference started hours after Trump, in his State of the Union address, lauded what he said was the near-complete victory over ISIS. He also reaffirmed his determination to pull out the roughly 2,000 U.S. troops from Syria. He had said in December that the pullout would proceed quickly. Trump planned to speak to the coalition later Wednesday. He was expected to urge partners to step up efforts to ensure the defeat of ISIS is permanent. 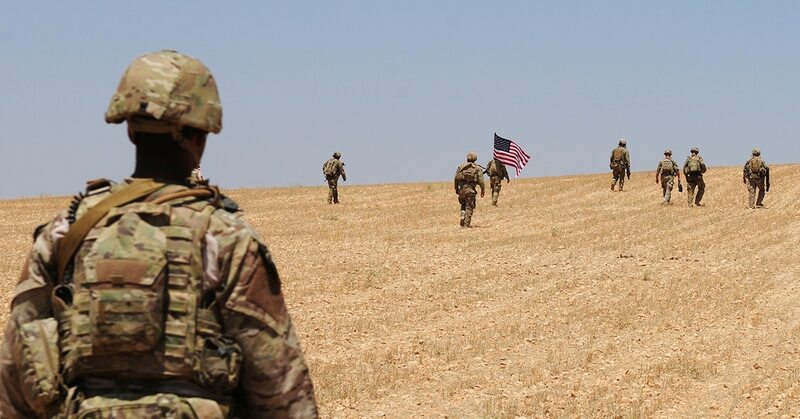 U.S. officials in recent weeks say ISIS has lost 99.5 percent of its territory and is holding on to fewer than 5 square kilometers in Syria, or less than 2 square miles, in the villages of the Middle Euphrates River Valley, where the bulk of the fighters are concentrated. But in liberated areas across Syria and Iraq, sleeper cells are carrying out assassinations, setting up checkpoints and distributing fliers as they lay the groundwork for an insurgency that could gain strength as U.S. forces withdraw. Activists who closely follow the conflict in Syria already point to signs of a growing insurgency. 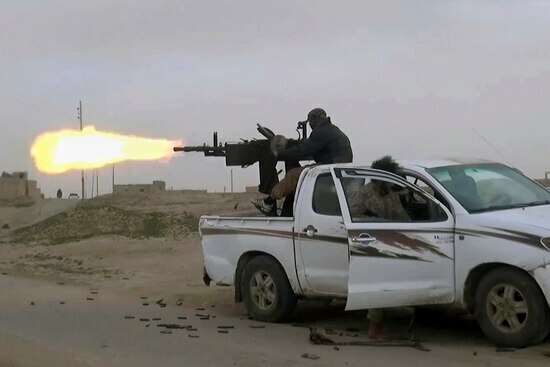 Rami Abdurrahman, the head of Britain-based Syrian Observatory for Human Rights, says ISIS still has 4,000 to 5,000 fighters, many likely hiding out in desert caves and mountains.